We examine market reactions to changes in the FTSE SmallCap index membership, which are determined quarterly based on market capitalization and are free of information effects. Our main results are asymmetric price and liquidity responses between the firms that are shifted between FTSE indexes and the firms that are new to FTSE indexes. Firms promoted from a smaller-cap to a larger-cap FTSE index experience a permanent increase in stock price accompanied by improvements in liquidity. Similarly, firms demoted from a larger-cap to a smaller-cap FTSE index experience a permanent decrease in stock price accompanied by declines in liquidity. In contrast, firms added to the FTSE SmallCap index that were not previously in FTSE indexes show a transitory price gain and declines in liquidity. The results support the liquidity and price pressure hypotheses. 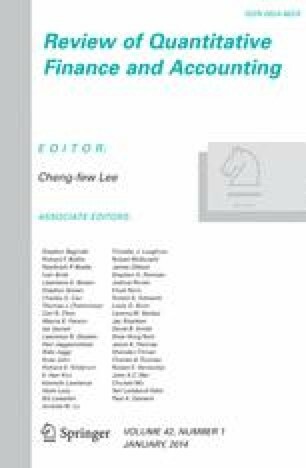 The authors thank Cheng-Few Lee (Editor-in-Chief) and two anonymous referees for their comments and suggestions. We also appreciate helpful comments from Anna Agapova, Don Cyr, Fayez Elayan, Robert Welch, and seminar participants at Brock University, the 2010 Financial Management Association European conference, and the 2010 Multinational Finance Society conference. Financial support from the Brock Social Sciences and Humanities Research Council (SSHRC) Institutional Grant is gratefully acknowledged.